25 by 25: The New 3 by 5? Devi Sridhar is Lecturer in Global Health Politics at Oxford University. Lawrence O. Gostin is Professor of Law at Georgetown University, Faculty Director of the O’Neill Institute for National and Global Health Law, and Director of the World Health Organization’s Collaborating Center on Public Health Law and Human Rights. Derek Yach is Senior Vice President of Global Health and Agricultural Policy at PepsiCo and former Executive of the WHO. 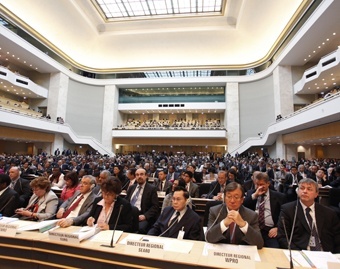 The 65th session of the World Health Assembly in Geneva, Switzerland. Credit: WHO. The 65th session of the World Health Assembly concluded on Saturday 26 May. The discussions over the week had a clear focus on non-communicable diseases, in part due to the release of the World Health Statistics, which noted that one in three adults have high blood pressure, and one in ten have diabetes. In light of this, the WHA agreed to the target of reducing premature mortality due to noncommunicable diseases by 25% by 2025. This leads us to ask: on what basis was the target set and who is required to do what and at what cost to achieve the very laudable goal? As we note in our recent Foreign Affairs article, NCDs present a different challenge than the traditional infectious disease model. Although complex in its own right, smallpox eradication required a simple intervention to be applied to a large numbers of people by medical/health personnel. The target was met, a few years later than planned, but within a reasonable amount of time. Polio eradication requires a similar approach but entails even greater complexity. The HIV/AIDS target of three million people on treatment by 2005 required changes in drug pricing; geared up health services and pharmaceutical production and distribution; and addressing stigma and access issues. The actual target was met, again a little late, but the bar has been set higher with efforts being made to reach universal access to antiretrovirals in the face of challenges such as adherence, drug resistance and rising costs all at a time of decreasing health revenues from ODA. Which gets us to the new target. Member states agreed to adopt a global target of a 25% reduction in premature mortality from noncommunicable diseases such as cardiovascular disease, cancer, diabetes and chronic respiratory diseases by 2025. But, the trends in the key risk factors of smoking, alcohol, unhealthy diet and insufficient physical activity are increasing as are the trends for the most powerful single driver of NCDs- aging. Furthermore, to achieve the scale of reduction needed to meet the 2025 target will place a focus on short to medium term treatment given that medical interventions gain quicker results than prevention. If all children today never smoked or became obese and performed as athletes—the target would not be met but at least we would be on our way to dramatically lowered death rates from 2040 onwards. The sober reality of lags in risk reductions and death rates is rarely discussed yet needs to be if we are to take the long sustainable view. The treatment goals to make it to 2025 – and even more so the longer-term prevention aspirations – would require a new form of governance and funding unprecedented in global health. It would require a dramatic increase in funding levels; the full engagement of pharmaceutical companies and public health professionals to extend access and adherence; the creation of facilities to vaccinate, screen and affordably treat cancers. It would also require global leadership on NCDs, which is currently missing. A new approach is needed if the 25 by 25 target is to have a chance at being realized. An innovative approach would require deeply committed public-private partnerships, the use of IT, low cost and effective diagnostics and poly-therapies. And beyond the health sector, it will require buy-in from ministries of finance, trade, customs and transportation. But perhaps, like what 3 by 5 did for HIV/AIDS, the NCD target is more a rallying call for the global community to prioritize these conditions, rather than a real target based on evidence. And, if it proved true, it could become a powerful tool in itself.